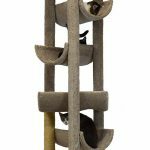 We review a lot of pre-made, easy-to-set-up cat trees on this site, but some people might prefer to just make one on their own. It can be fun to make your own because you can get creative with the design, or build to a specific size or schematic for your living situation. 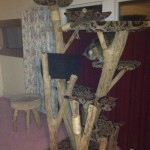 Here’s a good, lengthy video showing what goes into making your own cat condo. These guys have a lot of tools at their disposal. This is a good opportunity to see some of the details in what work you’ll have to do to make it all happen, it can help you plan out the process of your own build much better by watching somebody else do it first.